In New York, Two Big Arts Institutions Go Small Lincoln Center and the Brooklyn Academy of Music recently opened new, smaller theater spaces designed by architect Hugh Hardy. There, new works can be performed without the financial pressure of filling a large theater — and with cheaper tickets, they can attract the younger generation, too. 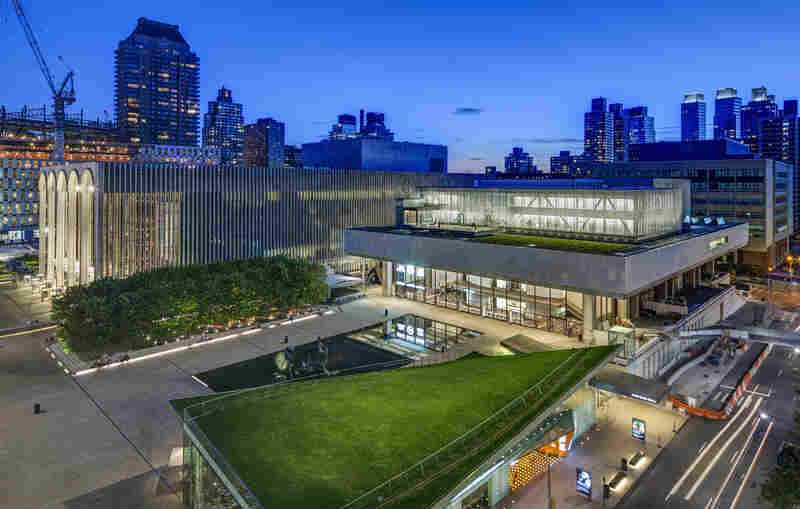 Lincoln Center represents New York culture with a capital C. The Brooklyn Academy of Music, or BAM, across the river, has long presented scrappy alternative programming. But both recognize that to survive and thrive, they need to develop new works and new audiences. Now, those two big artistic institutions have decided to go small. 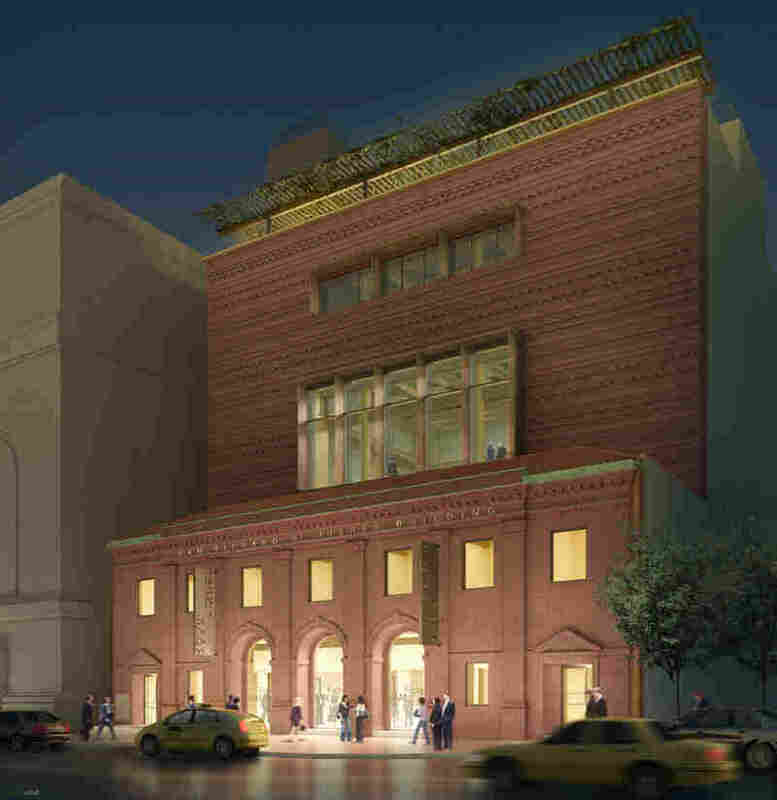 The Lincoln Center Theater and the Brooklyn Academy of Music have invested millions of dollars to fund new theater spaces for new work. LCT3's Claire Tow Theater is a two-story structure built on a steel truss that straddles the roof of Lincoln's Vivian Beaumont Theater. 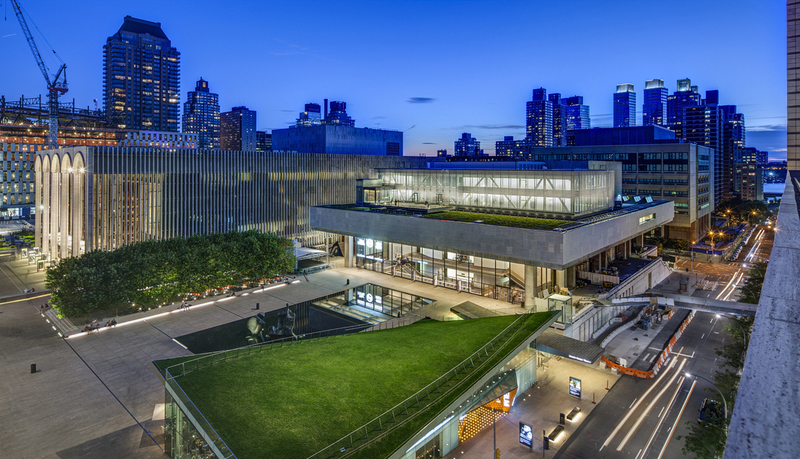 Before or after performances, theatergoers can mingle over drinks at a roofdeck bar that overlooks Lincoln Center and the surrounding neighborhood. Andre Bishop, Lincoln Center Theater's artistic director, started a program called LCT3 a few years ago. "The idea was to work with new writers and, honestly, a younger generation, and also audiences," Bishop says. "We'd have a $20 ticket and do the sort of work that would attract younger generations." BAM's executive producer, Joe Melillo, wanted to find a way to tap into Brooklyn's burgeoning arts scene and create a flexible space to present new dance, music, theater and multimedia work, without the financial pressure of filling one of his large theaters. "We need a platform — we need architecture to respond to these artistic issues, these initiatives, these passions, these ideas, if BAM is going to be relevant in the 21st century," Melillo says. Both Melillo and Bishop turned to Hugh Hardy, an architect and theater enthusiast, who began his long career as an assistant to the famed set and lighting designer Jo Mielziner. Hardy says he's excited by how these two very different spaces serve similar purposes. "It's a different attitude about production and about ideas," Hardy says. "The ideas that are being looked for here are different — and quite wonderful, because of the wide range they represent." 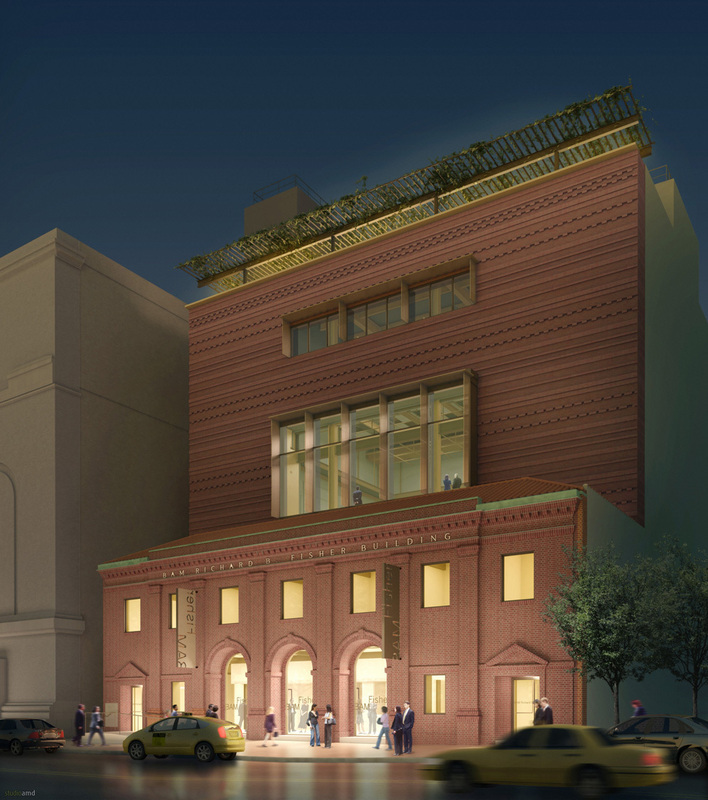 Brooklyn Academy of Music's new building, BAM Fisher, is home to a flexible 250-seat theater, which resident artists can configure in any way they want. Hardy came up with designs that are theatrical and ingenious, and reflect the artistic institutions they're built for. In the case of the LCT3, he had to figure out where to put the theater in an arts center with precious little room to expand. "We tried to put it below, we tried to put it where the offices are; there isn't any place we haven't tried to put that theater," Hardy says. "And so, we thought, well let's put it on the roof!" Well, not exactly on the roof — three feet above it. 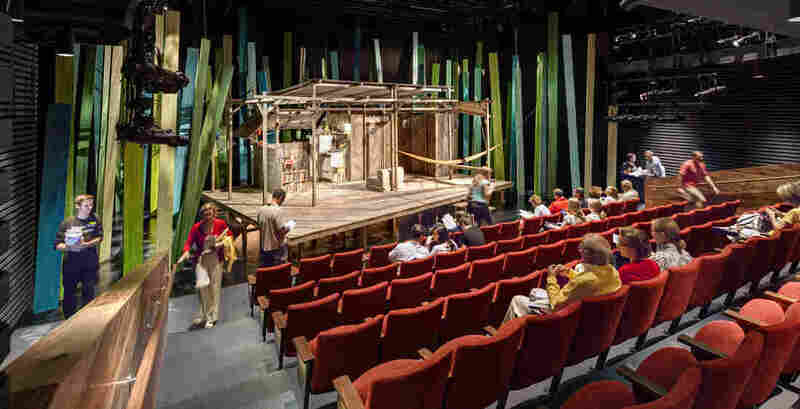 The 112-seat Claire Tow Theater is housed in a two-story structure built on a steel truss that straddles the roof of the Vivian Beaumont Theater. The interior is warm and inviting — reddish orange seats, surrounded by walnut paneling. But perhaps more striking is the view outside the auditorium — a spectacular vista of Lincoln Center and the surrounding neighborhood. The $42 million building features a roof deck and a bar that's open before and after performances, says Ariel Fausto, Hardy's associate architect on the project. It's such a departure from the dinner-and-a-show model. Here, it's a drink and a show and a drink. "It's such a departure from the dinner-and-a-show model," Fausto says. "Here, it's a drink and a show and a drink. And that, I think, speaks to a lot of the younger audiences. The terrace that's outside really allows for that. And, if the artists are around, it really offers that level of interaction, I think, over a drink." Over in Brooklyn, Hardy had a different kind of challenge. BAM purchased a rundown red brick building, a former Salvation Army outpost, next to its main theater, for Hardy to redesign. "Over time, it had been made into a fortress," Hardy says, "because this street had become so dangerous and the arches were filled in with masonry, the doors were made solid, there were bars on the window, there were fluorescent signs saying, 'Salvation Army.' It was a really awful experience walking by, and most people didn't know this building was here." The $50 million BAM Fisher building was created from a rundown former Salvation Army outpost. Despite its rundown condition, the building was a historical landmark, so when Hardy built the new $50 million BAM Fisher building, he had to pass muster with the Landmarks Preservation Commission and his clients, who wanted it to serve several purposes. The result is a seven-story building, with offices, classrooms and a large rehearsal room. Like the original, it uses lots of red brick, but it's no longer a fortress — there are windows everywhere. 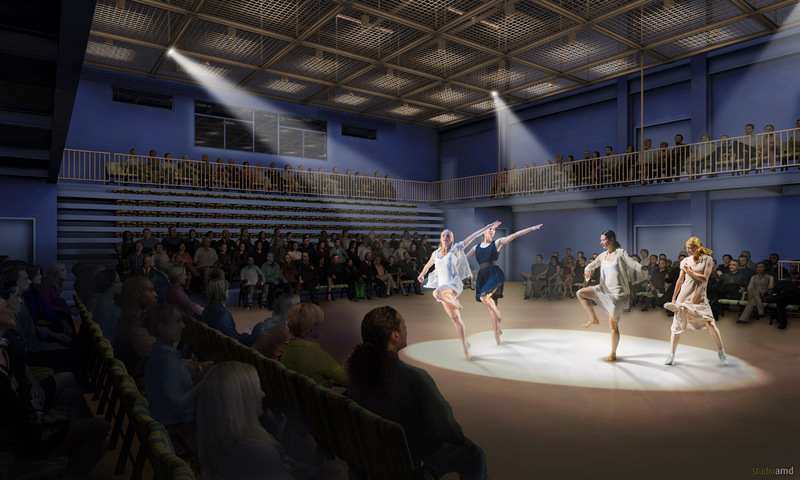 At the BAM Fisher's heart is a flexible 250-seat theater, which resident artists can configure any way they want to. And there's a roof garden with a spectacular view of Brooklyn and the Statue of Liberty, too. "There's no other place in BAM that looks out," Hardy says. "Even the director's office, which has a window, looks out at the brownstones next door. There's no sense of being in Brooklyn. Now there is." The BAM Fisher opened the 30th annual Next Wave Festival on Sept. 5 — all tickets are $20. LCT3 opens its 2012-2013 season on Oct. 7.